Bergen Premiere Dentistry in Ramsey, NJ offers root canal treatment, also called endodontic therapy, to treat severe infection around the nerve tissue or soft pulp of the tooth under anesthetics. This involves a series of procedures designed to save the tooth and repair any complications surrounding the tooth’s pulp tissue, which can eliminate the causes of serious tooth pain. Many people associate root canal treatment with unbearable pain, however, the treatment itself is comparable to having a dental filling. The procedure enables you to keep your natural tooth, which your dentists at Bergen Premiere Dentistry prefer over any type of tooth replacements. Root nerve infection typically begins with pulp nerve inflammation caused by sever tooth decay. Untreated dental cavities often give bacteria the opportunity to grow in the center of the tooth where they can infect the nerve. Another common cause is when bacteria makes their way down to the pulp through a cracked/chipped opening in the enamel. Tooth trauma that can cause nerve impairment can also occur from sports injuries, car accidents and even from extensive dental work. Infected root nerve causes toothache and to relieve the pain and/or prevent more serious complications, your dentists at Bergen Premiere Dentistry may recommend tooth extraction or root canal treatment to save the tooth. Following a rigorous dental exam, your dentist at Bergen Premiere Dentistry will decide whether you need a root canal treatment or not. The procedure starts by injecting anesthetics to numb the infected tooth and its surrounding area. 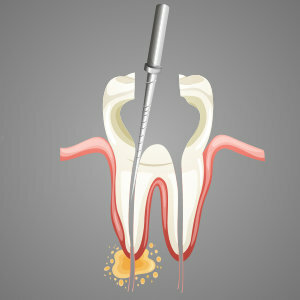 An opening will then be drilled for the dentist to access the infected or dead pulp nerve and the root canals. A small instrument with the help of a microscopic aid is inserted in the narrow opening and used to extract the infected tissues and clean any abscess. Following the disinfection of the empty gaps, the tooth is filled and sealed. Most root canal patients at our clinic in Ramsey, NJ experience some tenderness and abnormal sensitivity around the affected area for several days after their treatment. Ibuprofen and over-the-counter pain relievers are usually enough to ease the pain and discomfort. Bergen Premiere Dentistry can also provide prescriptive medication if necessary.